Feedstock Pathogen Reduction for Anaerobic Digestion! Feedstock pathogen reduction is an essential pre-treatment step for anaerobic digestion. Any feedstock that contains pathogens or infectious microorganisms need to go through some level of pre-treatment for hygienisation, sterilization or pasteurization based on the degree of contamination. The degree of treatments depends on both the temperature and the holding time. Sterilization can be achieved by at least 20 minutes of exposure at a core temperature of more than 133 °C and an absolute steam pressure of no less than 3 bar. In the other hand pasteurization is critical for waste containing animal by-products and required at least 60 minutes in the temperature range of 70 to 90 degree centigrade. 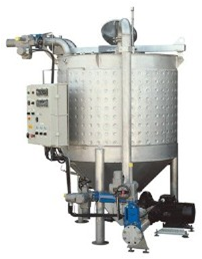 BioChop Hygienisation Unit (www.landiainc.com), is a completely free-standing unit for the mixing and heat treatment of the feedstocks and can be supplied in various sizes as per manufacturer website. When the feedstocks are added to the unit, it is comminuted, liquefied, heat treated and pumped back out in one process. The BioChop unit also claimed to minimise obnoxious smells and prevent pests from entering the residual products. Go back to Anaerobic Digestion Pre-Treatment Home!